Superior HD 4 Megapixel Video Resolution at 20fps with latest Ambarella Chipset. Record and Playback using an Amcrest or ONVIF NVR, FTP, or Blue Iris. Optional Amcrest Cloud Video Recording service is also available. This is a Power Over Ethernet (POE) camera and requires a separate POE Injector or POE Switch to operate. A power supply and a POE injector are NOT included, and are sold separately. We recommend purchasing a TP-Link POE Injector or POE Switch if you currently do not have any type of POE power supply. Quick Power Over Ethernet Setup via iPhone or Android Smartphone using the Amcrest View App (Included). Seamlessly Stream Video Directly to Your Smartphone, Tablet, Apple Mac or Windows PC. 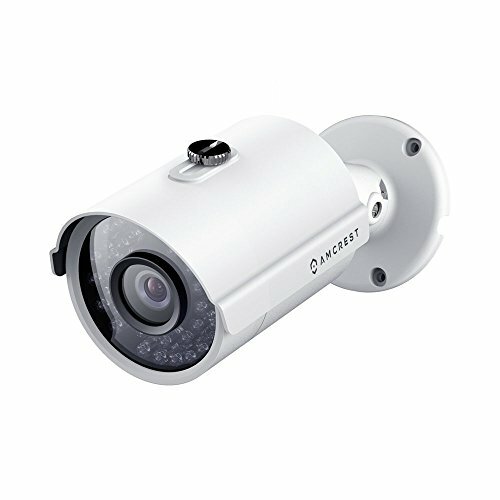 Remarkable Field of View with Wide 83 degree Viewing Angle, Intelligent Digital Zoom, and IR LED Night Vision Up to 164 feet.